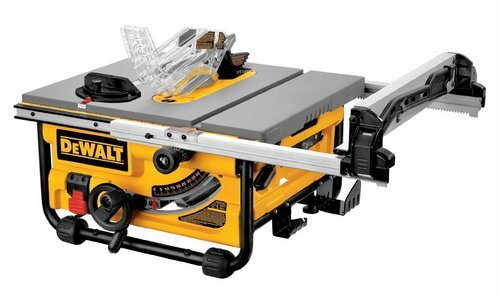 There are lots of great options for portable table saws out there from great brands right now. Some of this years models offer improvements upon previous models, and some are new players completely. We take a look at the best portable table saws of the year 2019 and we also name our favorites. Click on the model name of each saw below to jump to more info. 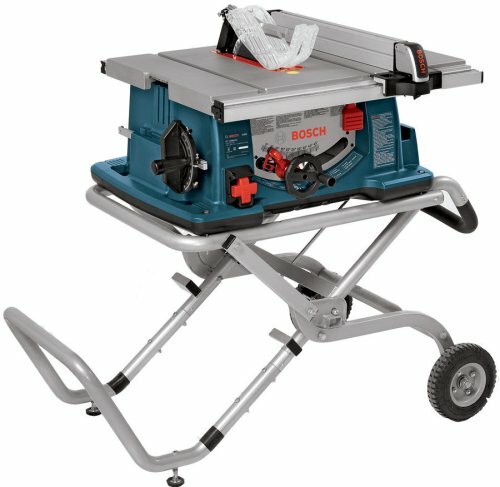 The Bosch 4100-09 is Bosch’s popular worksite table saw. It has a powerful motor, features that are easy to use, and all accessories are stored on-board. It is well-built and sturdy, made with machined aluminum. In the world of portable table saws, this is one of the larger, heavier units. But it comes with a very nicely designed, rolling stand to make the table saw quite portable. The ‘09’ model indicator means that this saw comes with the Gravity-Rise Stand by Bosch. The saw attaches to the stand and the combined saw/stand can be moved easily on the wheels or stored by folding the stand vertically. The stand move easily from a folded to standing position, and vice-versa. Powerful – It has a 15 amp motor with a no-load 3650 RPM. Rip Fence – Users say the SquareLock rip fence is accurate and workable. Integrated Storage – Can store all attachments on/in the saw. Safety Features – Users say that they actually use these safety features as compared to other, more difficult-to-use safety features on other saws. Takes Dado Blades – You can buy a dado blade insert for this saw. Gravity-Rise Stand – The stand is easy to fold up or down, and when folded vertically the saw/stand take up little space for storage. Included Blade – Users are not generally impressed with the included blade and recommend upgrading right away. Miter Gauge – As with other portable table saws, the included miter gauge isn’t impressing anyone and users recommend upgrading. They say the included gauge is sloppy in the tracks. Dust Collection – Some users say the dust collection is pretty sloppy and this saw likes to kick up dust. Users also say that this saw sits a couple inches higher than other comparable saws/stands, and that it took some getting used to. 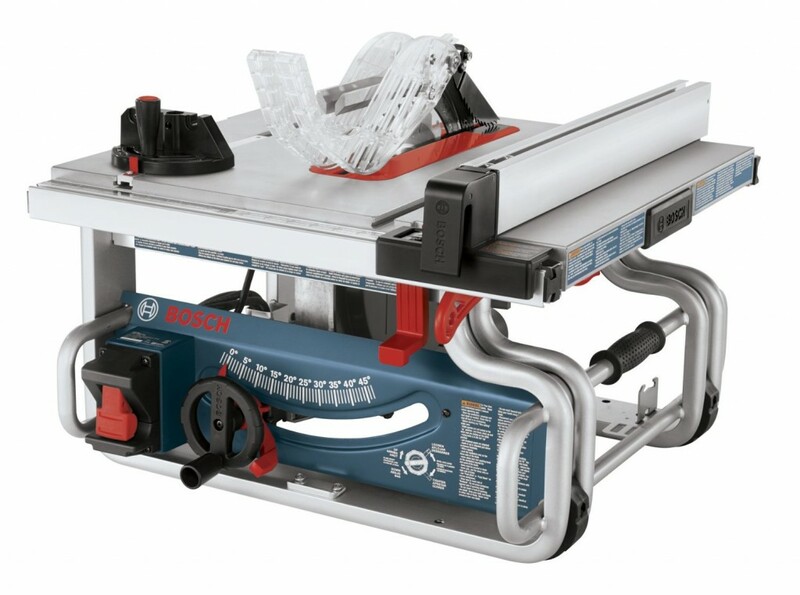 Overall, the Bosch 4100-09 is a very solid portable table saw, with many happy buyers. It is designed for somewhere between home use and contractor use, trying to cater to both crowds. It is easy to use and easy to move, while also being powerful and capable of doing more heavy-duty cutting jobs compared to smaller table saws. The Dewalt DWE7491RS is another one of Dewalt’s top rated portable table saws. It is also the biggest and most expensive. We picked this as one of the best from Dewalt as it has the largest rip capacity and a large number of happy users. This table saw is a good contrast to the smaller, more lightweight DW745. This is technically a portable table saw, but it weighs in at 110 pounds. What makes it portable is the included rolling stand. One person can move this saw easily with some good maneuvering on the easy-rolling wheels. 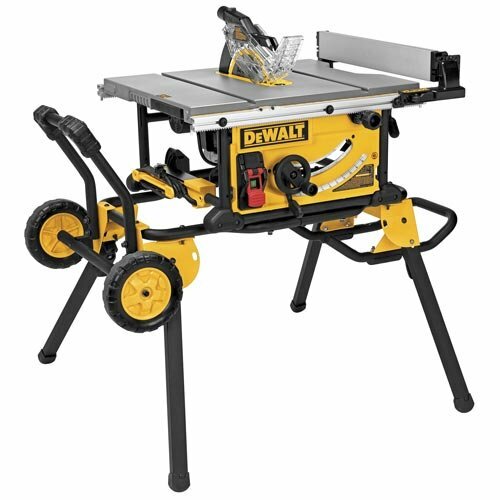 The Dewalt DWE7491RS is often referred to as a contractor table saw as it is portable but has the power and size to handle larger cuts and materials. It is good for serious home users as well as jobsite applications. Powerful – It has a 15 amp motor with a no-load 3850 RPM. 3 Year Warranty – All Dewalt tools come with a good 3 year warranty. Rip Fence – Users rave about the precision and usability of the rack and pinion rip fence, like the other Dewalt saws. Low Friction Table Surface – The table surface easily slides materials over it. Rolling Stand – Comes with a rolling stand that makes moving this saw easy. When the stand is set up it is very stable. Dado Blades – It takes up to an 8 inch dado blade with 13/16 inch width if you use the dado insert available for this saw. Table Coating – Some users say that that coating wears off when the table is stressed with friction. Uneven Tables – Some users report that the table on their unit has a slight slope of a fraction of an inch or less. Heavy – The saw itself is very heavy, but users leave it permanently attached to the stand for the most part, which makes it easy to move. Miter Gauge – Users don’t like the miter gauge and recommend upgrading this accessory right away. Users of this saw say that it approaches cabinet table saw capabilities but still remains moveable and storage-friendly. 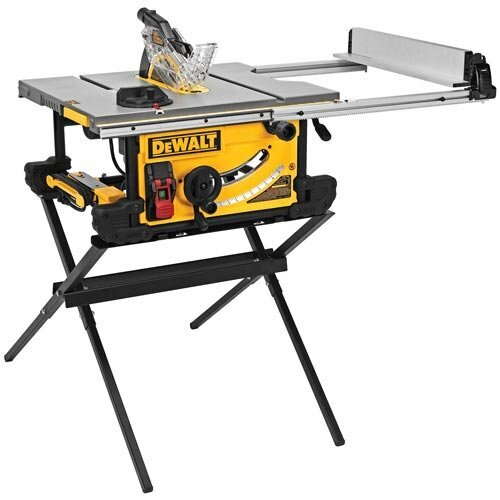 The Dewalt DWE7491RS is a good balance for people looking for a serious table saw with portability. If you buy this saw, consider that you will probably want to upgrade the miter gauge and maybe also purchase the dado insert if needed. 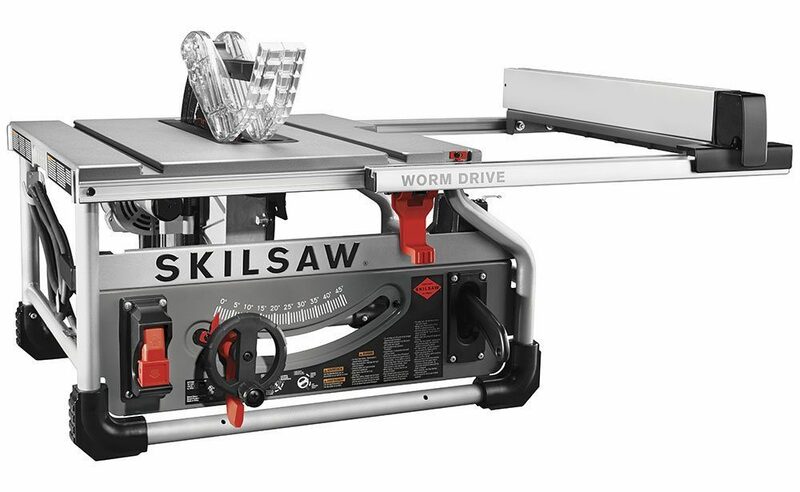 The Skilsaw SPT70WT-01 is the first worm drive portable table saw. It uses the same type of worm gearing that is more commonly known to be found in circular saws, which gives this table saw some different qualities than the other table saws on this list. The worm drive gives this saw excellent torque and Skil says this saw is designed for ripping. So, especially if ripping is your thing, this is an awesome table saw to take a look at. The Worm Drive is a first of it’s kind on a table saw, giving it an edge in torque and power. Thoughtful placement of features and accessories makes this saw easy to use and easy to figure out. It’s also lightweight and easily stored. Large Cutting Table – Extends enough to allow cutting of 4×8 sheets of plywood. The dust port is also well implemented on this saw, and people that hook this up to dust collection systems have good luck keeping dust under control, compared to some other saws. Some users who have used this saw for dado cutting have run into frustrations. Some have had issues with the blade retracting during use with heavier dado blades, and some say the dado and other inserts aren’t very well made or very flush. The worm drive also requires maintenance, so owners must be aware that the saw requires lube maintenance on the motor/brushes every 6 months or more often depending on use. Powerful – No bogging down. The Worm Drive give this table saw excellent torque and cutting power. Smooth – The Worm Drive also helps reduce vibration. Easy to Use – The design is well thought out, features are intuitive. Light – One of the lighter saws on this list, very portable. Dust Collection – Does a great job of sending dust out the dust port and keeping it off the cutting table. Retracting Blades – Some users have reported issues with the saw blade retracting during usage, especially with heavier blades. Miter Gauge – The included miter gauge is ok, but like most portable table saws, users recommend upgrading. Dado Cutting – Users are unhappy with the dado inserts (recommend making own inserts) and some say the blade retracts during use with heavy dado blades in use. Overall, owners are quite happy with the Skilsaw SPT70WT-01. They like how easy it is to use and how powerful it is. Skill has put out a nice portable table saw with this one. The Dewalt DW745 is one of the more portable and compact table saws on this list, and it also has one of the smallest cutting tables of this bunch. It only weighs 45 lbs and is easy to carry around. If you are looking for a smaller, lighter saw that has good cutting power, this is worth taking a serious look at. You won’t find a lighter table saw on the market, most likely. This is about as light as it gets. The original version of this saw only had a 16 inch ripping capacity, but the newest version of this saw has a 20 inch ripping capacity. In fact, keep an eye on that particular spec to know which version you might be looking at (older or newer). The combination of the roll-cage design for the base of this saw, along with plastic housing and it’s small size is what keeps it lightweight. Keep the size in mind when you are considering whether you want a saw this small. Many home or hobby users find the size to be practical and useful. However, shop owners or heavy-duty users might want to look at larger or heavier saws. If you are using this saw in heavy-duty applications it might not feel sturdy and the size might be limiting. If you do buy this saw, you most likely will find yourself wanting to upgrade the included miter gauge. Many people find the included miter gauge to be sloppy and hard to work with. The Dewalt DW745 is the lightest and smallest table saw you will probably find. This saw cuts some corners to be offered at its low price point, but is a good value if you take the time to set it up properly and get a good unit from the factory. The Dewalt DWE7490X is a great medium-sized option for Dewalt table saw fans. This table saw has a large rip capacity of 28 inches, and comes with a stand – so it can work well for home or job-site users, depending on the application. Many people compare this to the Bosch 4100 table saw, in terms of size and capabilities. Rack & Pinion Rip Fence – People really like this feature. The rip fence feels light, but adjusts and locks into place easily – it runs on a track and can be adjusted with the turn of a knob. Scissor Stand – This saw does come with a stand. The stand isn’t as portable as some other saws we list here, though. It doesn’t have wheels and can’t be folded while bolted to the saw. It also isn’t height adjustable. But it is sturdy. In terms of size and capability, this table saw is on the larger end of the portable table saw scale. The rip capacity, at 28 inches, is only smaller than the DW7491RS that we also list here. People who use this saw at home find that it will cut just about anything they throw at it. In terms of limitations, cabinet makers who have given this saw a try have found it to be limiting in terms of size. Rip Fence – Is easy to use and accurate. Cutting Ease – Has good cutting power and capacity, is easy to use and adjust. Sturdiness – The stand, while not the most portable, is very sturdy. Miter Gauge – You will likely find yourself upgrading the miter gauge if you use it regularly. Portability – While this is a portable table saw, the stand doesn’t have wheels – and the stand can’t be folder while the saw is bolted on. The Dewalt DWE7490X is going to be an overall good table saw for home and light contractor users, but the stand sacrifices a little bit of portability. The features and rip fence make it an accurate and easy saw to use, and it’s not too big or too small. 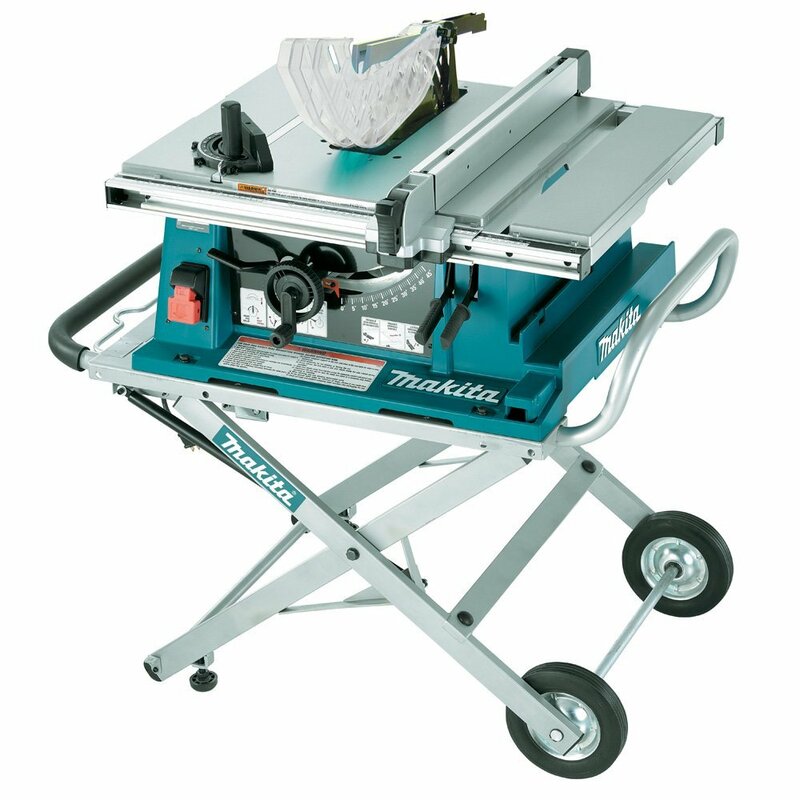 What the Makita 2705X1 is: a bulkier portable table saw with a powerful, smooth motor and a larger cutting table. The X1 version comes with the stand, but you can also buy it without, depending on your needs. Home shop owners seem to be the types of users that like this saw the most. Feels Bigger/Bulkier – Even though it doesn’t weigh in at the heaviest, it has a bulky build. Some people like that, some don’t. Owners who leave this in their shops seem to like it the most. Rolling Stand – Even though it’s got bulk, the X1 model comes with a rolling stand which does put it back into the portable range. People are not too happy with the rip fence, the general feedback is that is works ok but it’s not great. Another thing owners quickly find out is that this saw will take a dado blade, but you can only use 6″ dado sets, not 8″. Accessory placement is another area with middling feedback. When it comes to making good cuts and getting work done, this saw delivers. It has a large enough capacity to handle larger sheets of wood and other materials, and the motor has enough power to cut through anything a homeowner could throw at it. Smooth Motor – The motor is powerful, fast starting and smooth. Fast Shut Off – Uses an electric brake to stop the blade. Collapsing Stand – You can fold the stand with the saw attached. Accessory Storage – Some of the accessory storage and placement feels a little awkward. Miter Gauge – The miter gauge feels sloppy and upgrading is recommended if you use it. There are many happy owners of the Makita 2705X1 portable table saw. For people who want a bulkier saw with a larger cutting table, this saw will fit the bill. The Bosch GTS1031 is designed to be easy to carry around – and once you get it to where you need to go, it has enough power to get the job done for most cutting situations. Due to it’s small size, you might struggle to cut large sheets of materials, but anything that fits onto the cutting table comfortably will be easily cut by the powerful motor. Well-placed Carry Handle – this saw is designed to be carried easily in one hand. Power – Lots of cutting power despite its small cutting table and size. Safety – Bosch does a great job with integrating safety features. Bosch is known for their safety features, and this saw has them in spades. All of the safety accessories are easy to use and easy to store, making them more likely to by used. People who own this saw like the rip fence and find it to be accurate and usable. The motor is very powerful, and some people who own this saw say it’s maybe even a bit too loud. Despite the use of metal in construction of the saws frame and casing, some of the switches and levers are disappointingly made from plastic. Portable – This is one of the more portable saws on this list due to size and design. Thoughtful Design – The accessories are well-placed and the saw is easy to use overall. Powerful Motor – The motor has enough power to get the job done. Rip Fence – Is easy to adjust and accurate. Plastic Parts – Plastic levers for extensions and blade adjustments feel cheap, despite most of the construction being very solid. Loud – The motor is powerful but loud as a result. The Bosch GTS1031 is an easy-to-carry saw that has a lot of screaming cutting power and not a lot of cutting table space. This saw has its place in both home use or job-site use. Here’s what you need to look out for when buying a portable table saw. Portable table saws come in a range of sizes – and portability typically just means that this saw can be moved around by 1-2 people. Some of these table saws are truly portable, in that they are designed to be picked up and carried by one person, one-handed. Some of the bulkier table saws come with rolling stands that make them more portable, even if the unit is too heavy for one person to carry. The more portable a table saw is, the smaller it will usually be and the cutting table size will be the biggest sacrifice for a small saw. This is where you will find the biggest variation in the various portable table saws. Some have a small cutting table and smaller rip fence extension, and some are quite large. Smaller saws are usually around 20 inches ripping capacity or a little less. The bigger saws can get up to 28-32 inches ripping capacity. All of these portable table saws have fairly powerful motors. There are a couple saws that claim they have enough power to cut 4x materials too. The saws that make this claim also have a maximum blade height of just over 3 1/2 inches to accommodate the materials: The Makita 2705 and the Skil SPT70WT. Not all saws can fit the standard 8 inch stack dado blades. This is an area where you’ll need to narrow down your search if you need a portable table saw that can cut dados. You will find that most of the portable table saws are using lighter-weight metals in their cutting tables, and as a result often have a coating that will get scuffed over time. This is a big difference from stationary table saws with higher quality machined surfaces. The most commonly complained about accessories with portable tables saws are the miter gauges. Most people that rely on accurate miter gauges will end up upgrading with most of these saws. Accessory placement and storage is important on a portable table saw, since it might be moved around and you can’t afford to lose track of important accessories. Look for easy to access on-board storage of all accessories. All of the Dewalt saws we cover have three year warranties, which is great and which is why many people like to go Dewalt. The Bosch, Makita and Skil saws have 1 year manufacturer warranties, that seems to be pretty standard. For most brands. There really are a lot of great portable table saws out there. Some have their drawbacks, but you won’t have any problem finding one that fits your specific needs, whether you are looking for maximum portability or maximum size and capability.